Go Fish rules are easy to learn, which is fortunate considering it is a popular game for families with young children to play together. All that's needed to play this game is a deck of poker cards and three or more players. It's possible to play with two, but it is not as much fun. The dealer gives each player five cards, face down, and puts the rest of the cards in a draw pile. The players all look at their hands but do not show the other players their cards. All players put any pairs in their hands face up on the table. If a player has three of a card, he or she cannot lay it down as a triplet. The player to the dealer's left looks at the cards remaining in his or her hand and picks one rank to fish for. He or she asks any one of the other players if he or she has a match for this card. For example, the player says, "Do you have a jack?" That player says yes and gives the asker the card or says "Go fish" if he or she doesn't have the card. If the player gets the card, he or she can lay down the pair and is allowed to take another turn. If not, he or she must take a card from the draw pile and pass play to the next person. The game ends when a person plays the final pair. However, this person is not necessarily the winner. The winner is the person with the most pairs laid down. If a person runs out of cards in the middle of the game, he or she has to take one from the draw pile. If there are no cards left in the draw pile, this person must sit out until the game ends. If a player asks for a card without holding the other half of the pair, this player also misses a turn but is not banned from making a match of this rank. If a player asks a question out of turn, he or she is banned from making the match asked about since this can affect the actions of the other players. If a player fails to notice he or she has a pair in hand and gives away one of the cards, he or she cannot ask for that card back. 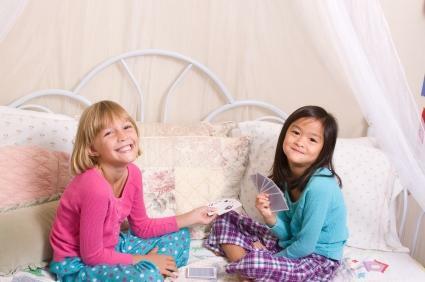 When playing with young children, it's okay to lessen the penalties for violating Go Fish rules so that they do not lose enthusiasm for playing the game. Specific card rule - Instead of simply asking for a rank of card, the player has to ask for both the rank and the suit. For example, he or she would say "Do you have a jack of hearts?" Go fish rule - Instead of play passing to the person to the left of the one who just went, it passes to the person the player attempted to fish from. Four card rule - Instead of simply making pairs, players have to obtain all four cards of a specific ranking before they can lay them down. In this version, fished players have to hand over all the cards they have in a specific rank instead of just one.